While in Missouri, we really enjoyed the drive to Shearwood Quilts. It is located in Jamesport, Missouri, which is in the heart of Amish country. We saw several Amish horse-drawn wagons on the road and the area was especially scenic. Since we were there in April and it was still cold, everything hadn’t greened up yet, so we had to imagine how much prettier it would be once spring really arrived. 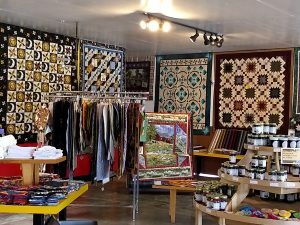 Besides the nice drive, Shearwood Quilts was a very nice shop. It was in a large building, so they had plenty of room to spread out. There were some amazing quilts on display and they also had gifts made by local artisans. Something that we noticed while in Missouri was the number of quilt panels we saw and Shearwood Quilts had an especially large inventory of panels. 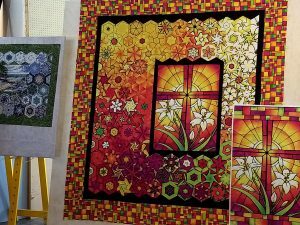 The quilt pictured on the right has a center panel surrounded by Stack and Whack hexagons. Take a look at our Gallery to see examples of the T-Shirt Quilts as well as few of the many other quilts we have made. I started making quilts as a child and have been quilting for others for over twenty years. Quilts that I have quilted have been featured in several quilting books and magazines.